Never under-estimate a simple hand embroidery stitch! In hand embroidery, the technique of “whipping” an embroidery stitch is a terrific thing to know. Whipping a stitch gives you a whole new stitch with a whole new look! For whipped running stitch, first you need to know how to work the most basic embroidery stitch – the running stitch. Whipped running stitch is a simple, quick stitch to work. This stitch is one of many line stitches that can be used for bold or delicate outlines, depending on your choice of thread. In the photo above, the first line of stitching is a whipped stitch. In this case, it’s a backstitch, but you can achieve the same look with a running stitch. The whipped running stitch looks great when using two colors of thread, as I did in this video tutorial. However, if you want a solid line out of one color, you can use it for that, too! You can change the look of the stitch by varying the spacing of your running stitches. To learn how to work the running stitch, you can check out the video tutorial or read the illustrated instructions. If you want to see some examples of whipped running stitches in bold colors, you can explore the article on embroidery for children. 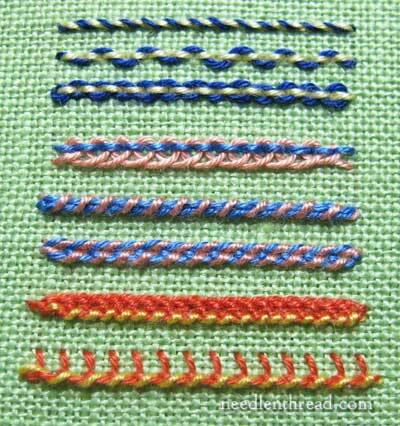 This is a simple stitch, and kids especially love it – but it isn’t limited to kid use! The video below is somewhat old! But it’s scheduled for a re-do sometime soon! If you’d like to learn more embroidery stitches, you can find over 75 how-to videos for hand embroidery here on Needle ‘n Thread, along with many other embroidery stitch instructions in this A-Z stitch dictionary, and, for fun, complex, and interesting stitch combinations, check out the Stitch Fun Series, too. THANK YOU…I learned to embroidery many years ago when I was a teenager and have not done any in years. Having these videos to help me return to an art form that I loved and enjoyed has been such a blessing..You have taken the *intimidation factor right out of getting started again…if every there is a day when you wonder if all the energy and effort is worth it…read my note again and remember …please continue the wonderful great work. There are many of us *out there* that are so appreciative of your efforts. Again, thanks. This site is so incredibly amazing. My current project is to embroider a baby quilt and…thank you. What a beautiful, wonderful resource. Your videos are wonderfully clear and instructive. You make these beautiful stitches feel within anyone’s reach. Thank you. this is so wonderful!! I dont know how to thank u enough! Thank you so much! Whipped running stitch looks so elegant, I had always assumed that it was difficult. I’m going to try it today. What kind of fabric are you using? Can it be any fabric or does it have to be the kind that you cross stitch with? I’m sorry. One more thing. If it is a different fabric, how do you get it in a straight line? Thank you! Wow, I’m so happy to have found this site. Thank you for your time and effort on providing the public which such great instruction. If only more people would be aware of how relaxing and inexpensive embroidery is. Your videos are so easy to follow as well. Thank you. I must share your site on Facebook. This is an excellent site for beginners and experts alike. Hi, I’m new around here and new to surface embroidery. Your videos have been great so far and, under your tutelage, I’m making my first sampler. I have a question: how do you start the second thread for a whipped stitch? It seems that the 3 methods you teach wouldn’t work in this case because you’re not actually stitching the fabric, and therefore don’t go to the back to curb the thread. Thanks for your help! Thank you so much for making these videos. My young girls were interested in learning how to make a sampler (like the one from their great,great, grandmother we have) and this is allowing us to learn. Dear Mary, I am new to embroidery. I just wanted to say Thank you for your amazing videos teaching the different stitches. They have been so helpful with my new endeavor… I know I will continue utilizing your website for a long time… Again….Thank you. I gained lot of ways of stitching and I enjoyed of sewing. Thank you so much for the guidance and valuable tutorials. Hello, Madeleine – thanks for your question! No, I don’t sell CDs of the embroidery stitch videos, I’m afraid. I thought about it at one point, but I changed my mind. They are not very professional videos, and I think people would not like to pay the price I would have to charge for them. I enjoy your site so much. The library on stitches is fantastic. Thank you.